The 2016 U.S. election will decide one of the most talked-about races in national history. Locally, Nevadans have important decisions to make with regard to local races, as well as on multiple ballot measures, including voting on Question 2, which would legalize marijuana for adults and put the tax revenue from the sale of the drug toward education funding. There are many reasons to vote Yes on Question 2. 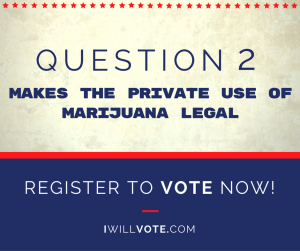 If Question 2 passes, marijuana would be legal in Nevada for adults ages 21+. It would create jobs, approximately 6,200 for Nevadans. The passage of Question 2 would also generate $1.1 billion in overall economic activity, including $60 million in annual tax revenue and approximately $20 million, per year, for Nevada schools. With regulated, licensed businesses, Question 2 would help to create safer communities by replacing a dangerous criminal market. Are you registered to vote and make your voice heard? There’s still time. Today, Sept. 27, is National Voter Registration day and you can check your registration, register to vote or update your registration at any time at iwillvote.com. Below, find some helpful Nevada deadlines for voter registration, early voting as well as some National Voter Registration Day events to attend today! September 27 • 12:30 PM – Sierra Vista High School Voter Registration Drive, Sierra Vista High School 8100 W Robindale Rd Las Vegas, NV 89113. Get Details & RSVP. September 27 • 4:30 PM – Bonneville Transit Center Voter Registration, Bonneville Transit Center101 E Bonneville Avenue Las Vegas, NV 89101. Get Details & RSVP. September 27 • 2:30 PM – National Voter Registration Day! Seafood City Supermarket 3890 Maryland Parkway Las Vegas, NV 89119. Get Details & RSVP. September 27, 2016 • 2:30 PM – National Voter Registration Day – Las Vegas, NV, Seafood City Supermarket Parking Lot 3890 S Maryland Pkwy Las Vegas, NV 89109. Get Details & RSVP.